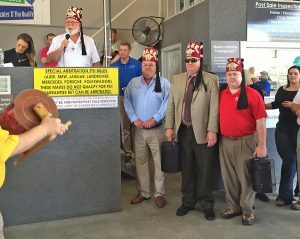 SAVANNAH, Ga. — Southeastern Auto Auction of Savannah plans to raise more than $10,000 for Shriners Hospital for Children, and will give away more than $25,000 in cash and prizes to its dealer clients who participated in the auction’s 4th annual “Cars, Cash & Caring” celebration, a 10-week long event. The Cars, Cash & Caring events will culminate at the auction’s weekly Wednesday wholesale auction, March 21, with a 1,000-unit sale, and $25,000 in cash and prize giveaways. Wayne DeLoach, Tommy Childs, and Danny Williams purchased in 1987 what was then a public auction. Today, the four-lane, wholesale auction typically runs 700 units per week with more than 350-400 dealer attendees. More dealers attend online using Simulcast and Edge Pipeline. Southeastern also hosts a public sale each Thursday where about 200 units are run. McCready said the auction was able to raise funds through the generosity of it dealers and vendors, as well as the hard work of the Southeastern team. “We have made it our goal to blow past $10,000 and raise even more for the hospital in 2018,” McCready said. Shriners Hospital for Children is committed to providing the best care for children in the specialty areas of Orthopedics, Burn Care, Spinal Cord Injury and Cleft Lip and Palate, regardless of the family’s ability to pay.